Unique romantic getaways and intimate settings in spectacular British Columbia, Canada. The BC Romantic Getaways Guide is the trip planning guide for lovers and romantics. 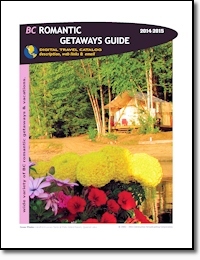 This free catalog offers a variety of BC romantic vacations and getaways. Unforgettable honeymoon and anniversary destinations for lovers. BC has it all. Luxury resorts, elegant hotels, secluded lodges and cabins. Soothing spas, fine dining, dancing, walks on the beach, trails in the woods, and so much more! Experience the romance of British Columbia, Canada! If your business specializes in unique romantic getaways, intimate accommodations at resorts, hotels or spas, or vacations for lovers, and you would like information on having your business listed in this catalog, contact us. BC Romantic Getaways Guide - A part of the BC Adventure Network. BC's largest travel network.